Following hot on the heels of my photographic post on Positano’s upper mountain passages is the third of my Positano paintings it inspired. 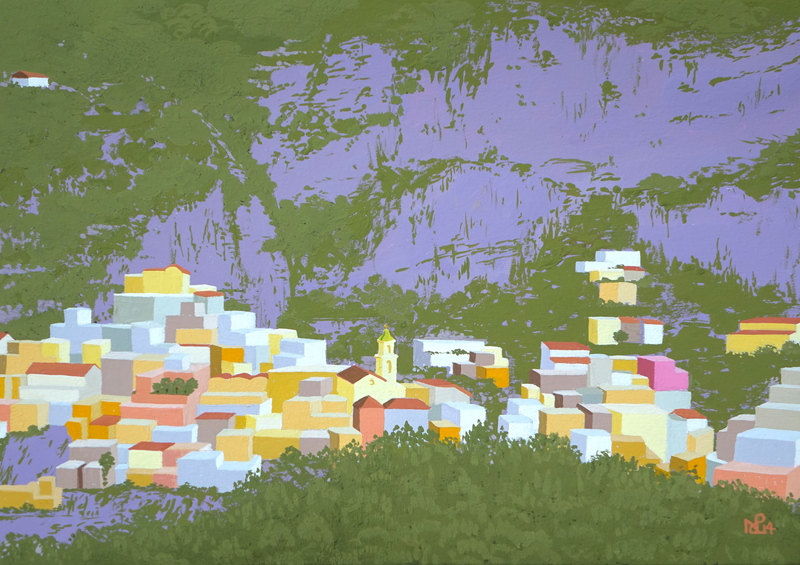 Unlike my previous two works of Positano, both of which included the sea and the beach as prominent compositional elements, this one concentrates solely on Positano’s mountainous backdrop as it focuses on a cluster of houses on the town’s upper mountain road. With its resulting rocky background and not a slice of sea or sky in sight, the group of pastel houses collected onto the mountain side is even more striking set against these dark and looming surroundings, emphasising just how striking a sight is created by a small town built upon the steep sides of huge imposing mountains. I kept this painting as simple as possible, and even though the mountains have the appearance of craggy complexity, the brain is doing most of the work here – for in reality I have painted neither shade nor light into the purple mountain – only the impression of texture as created by the strategic placement of green detailing indicating where the mountain’s verdant plant life would be. It’s an effect which I find altogether pleasing, and a simplicity which ultimately does all of the work which a more detailed illustration would provide. Yet in this simpler form it seems altogether cleaner and more contemporary – and for that reason I love it.